the very thought of them is enough to start off the itching and scratching!! It is a relatively uneventful school day which is abruptly interrupted by the arrival of the "nit nurse". As a result of the information sent home, painful parental probing of heads follows, together with contagious and synchronised scratching. As the fine toothed combs are dragged through the hair of complaining and recalcitrant children, vile smelling shampoo is put into action, very often on a "just in case" basis. Like it or not our bodies are the habitat for a wide range of organisms. Whether it is our skin or hair, teeth or intestine, blood or nerves, our bodies provide all the resources for healthy living for a huge variety of organisms. Lice are just one type of parasites which thrive on the human body. Lice are small wingless insects, well suited to their mode of living. Three types affect man: the head louse (Pediculus capitas, shown left above), the body louse (Pediculus corporis) and the Pubic or Crab louse (Phthirius pubis, shown on the right above). The louse's body looks squashed and flattened, enabling it to lie close to its host's skin. This is ideal for it to obtain the blood which makes up its diet. Human lice all belong to a group known as sucking lice (order Anoplura). Meal times involve three needle like structures (stylets) piercing the skin which is held back by a specially adapted tongue. This is followed by a pumping action of the throat which causes the blood to be sucked up. When not in use the stylets retract neatly into a pocket just behind the mouth. Meals are frequent and each takes a few minutes. Once a louse has found a a good blood supply there is little need for it to move, as its food resource is not going to go away. The legs of the lice are therefore, not so much for walking, but more for hanging in there. 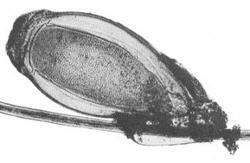 Their legs are inwardly curved and have well developed "claws" for hair grasping (shown in the image left). The claws in the pubic louse, which lives in the pubic region are very pronounced giving rise to its alternative name of crab louse and the more derogatory "crabs". 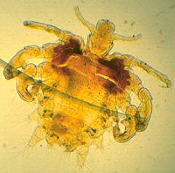 The body louse can live in the fibres of clothing, leaving only to feed on blood. 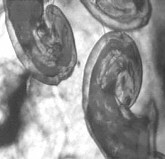 Eggs are laid singly or in clumps and are cemented to a hair (shown in the image right), though the body louse will also lay its eggs in clothing next to the skin. The hatching of the mature nymph is wind driven! Air is collected through the nymph's mouth and passes through its digestive system until the gas pressure is great enough to eject the nymph. The hatched nymph looks more or less like a smaller version of the adult. It undergoes three moults before reaching adulthood. The whole life cycle can take up to five weeks. Did you know these lousy facts? There are about 400 different species of sucking lice. Lice affect nearly all mammal species, though none is known to infect whales or bats, and none has been taken from duckbilled platypus, anteaters or armadillos. The body louse can carry diseases like typhus, relapsing fever and trench fever. During the Russian revolution, it is thought that three million people died from louse borne typhus. According to Dr John Maunder of the Medical Entomology centre in Cambridge, there is an increase in nit reports every autumn but not necessarily in nits. He suggest that the culprits are "carriers" who support colonies of nits without realising. These carriers don't itch and so don't treat their scalps but do infect others during the school holidays. It is estimated that head louse infestations are probably in the region of well over 100,000 per year in the UK. 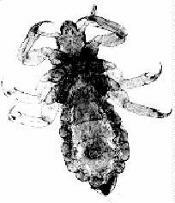 The body louse can carry diseases like typhus, relapsing fever and trench fever. During the Russian revolution, it is thought that three million people died from louse borne typhus. Lenin is quoted as having said at that time "Either socialism will defeat the louse, or the louse will defeat socialism". Nitshill in Glasgow has no lousy connections - it is thought that the "nit" in Nitshill is the Scottish word for "nut" or for Oak gall.